The Portuguese were the first Europeans into China in any meaningful numbers with Vasco de Gama leading the charge in 1498. However, rare pieces of Chinese porcelain did make it to these shores overland along Arabic trade routes a century before this. The British and Dutch who eventually became the main players in the China Trade were slower off the mark and it was another century before the formation of the Honourable East India Company of London in 1600 and the Vereenigde Oost-Indische Compagnie (VOC) in 1602. 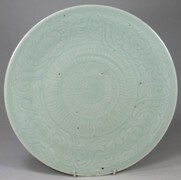 Whilst there are distinctive groups, such as the Han Dynasty and Tang Dynasty burial wares (unglazed and cold painted and primarily figural), Celadon wares (pale green glazed), Blanc de Chine (white glazed predominantly figural and made at Dehua) and Yixing (predominantly unglazed red ware primarily tea wares) and the 'so called' Provincial porcelain (blue and white and intended for local trade), the vast majority of porcelain familiar to Western eyes was made under the Imperial supervision of the Ming and Qing dynasties at Jingdezhen. There is a further sub-group known as Cantonese porcelain (made in Jingdezhen but profusely decorated at Guangzhou). 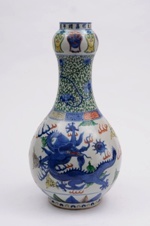 The earliest Ming Wares were decorated with under glaze blue on white with the appearance of pictorial subjects rather than a reliance on glaze colour. The first coloured wares appeared during the reign of Chenghua (1465-87) and are referred to as Doucai (meaning joined colours). 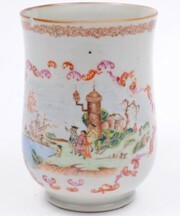 They consisted of a pencilled outline in under glaze blue filled with translucent colours. An example of the Wucai palette. 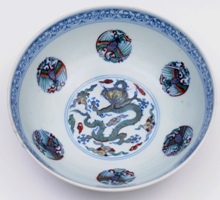 Towards the latter end of the Ming Dynasty, the Wucai (meaning five colours) palette usually red, yellow and green, with under glaze blue on a white ground became popular, reaching its peak of popularity during the reign of Wanli (1573-1699). 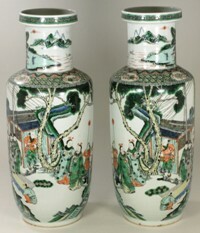 A pair of Famille Verte vases. In the early years of the Qing Dynasty during the reign of Kangxi (1662-1722), the Famille Verte (green family) and Doucai palette had a resurgence of popularity with the Famille Rose (pink family) palette finding favour during the prolific years of Yongzheng (1723-35) and Qianlong (1736-95). Whilst various colour spectrums fell in and out of popularity under glaze blue decoration on white maintained a consistent appeal through out.